International Holocaust Remembrance Day was commemorated in Ankara on January 24, 2019. The day started with a morning prayer held in Ankara Synagogue with the attendance of Turkish Jewish community members, and ambassadors and foreign mission representatives based in Ankara. Ankara Synagogue opened its doors for the Sahrit (morning) prayer. 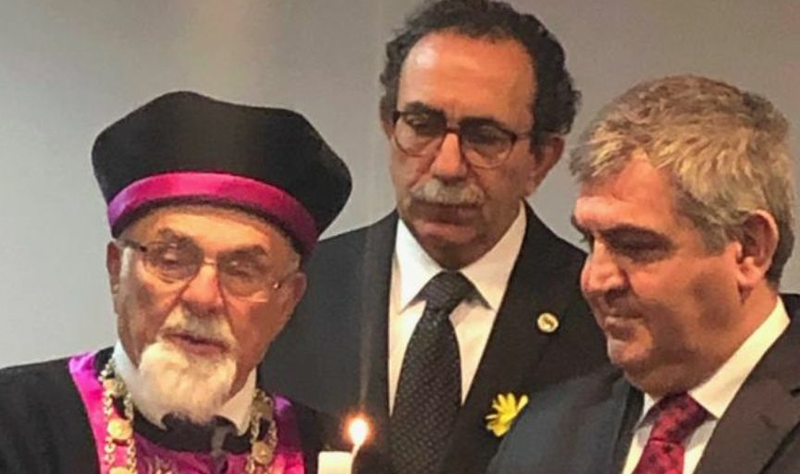 Chief Rabbi of Turkey Isak Haleva, co-President of the Turkish Jewish Community Ishak Ibrahimzadeh and the President of Ankara Jewish Community Can Özgön made speeches expressing the importance of commemorating the Holocaust. After the prayer for the memory of the Holocaust victims, Anoten prayer was read for the sake of the state of Turkey. The group met for a family photo with the sign #WeRemember to support World Jewish Congress’ initiative. Following the ceremony in the Synagogue, the official ceremony was held in Ankara University where Deputy Minister of Foreign Affairs Faruk Kaymakçı, President of Ankara University Prof. Dr. Erkan Ibis, Chief Rabbi of Turkey Rav Isak Haleva , Co-President of the Turkish Jewish Community Ishak İbrahimzadeh, the Director of Research Department of Foreign Ministry Aylin Tashan, students from Bahcekoy Acı highschool Zeynep Özay and Verda Sisa addressed the audience and mentioned in their speeches the importance of Holocaust education and the need of a legislation against hate speech. Deputy Minister of Foreign Affairs Faruk Kaymakçı commemorated the millions of Jews who were massacred by the Nazis during the Holocaust. He mentioned the fact that antisemitism, racism and xenophobia are still in the rise in the world and it is very worrying. He continued his speech saying that the Holocaust is the best example of what ethnic and religious hatred can lead to when it is not addressed properly. Ishak Ibrahimzadeh, the co-president of the Turkish Jewish Community, stated in his speech that the hatred that created the Holocaust 70 years ago, can still be felt today in different ways. Ibrahimzadeh said that all of the sufferings were sacred and that discrimination and hate crimes could only be overcome by love, rule of law and education. During the ceremony, a documentary prepared with the support of the Foreign Ministry is screened. The documentary explains Lina Amato’s life by her own words. She survived the Holocaust thanks to Turkey's Consul in Rhodes Selahattin Ulkumen. A video presentation of Izzet Keribar’s photos of Auschwitz death camp was screened too. Following the music concert and lyric dance performed by academicians and students of Ankara University, the ceremony ended with the candle lighting ceremony in memory of the victims of the Holocaust.